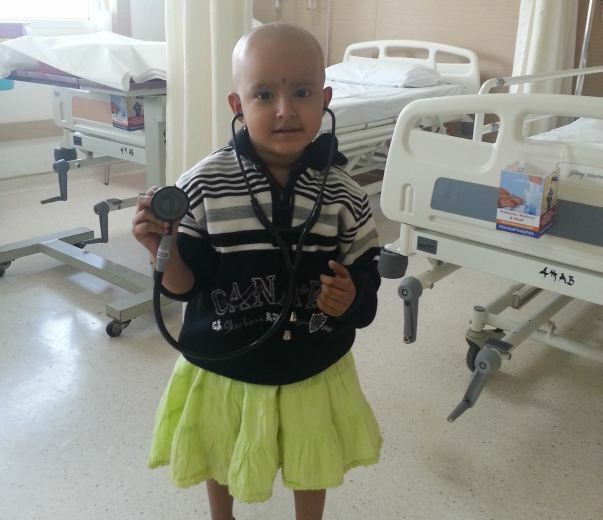 My daughter Ananya,is 2 years 8 months old and has been diagnosed with Acute Lymphoblastic Leukemia(ALL). We live in Bangalore and I was working as a sales executive. 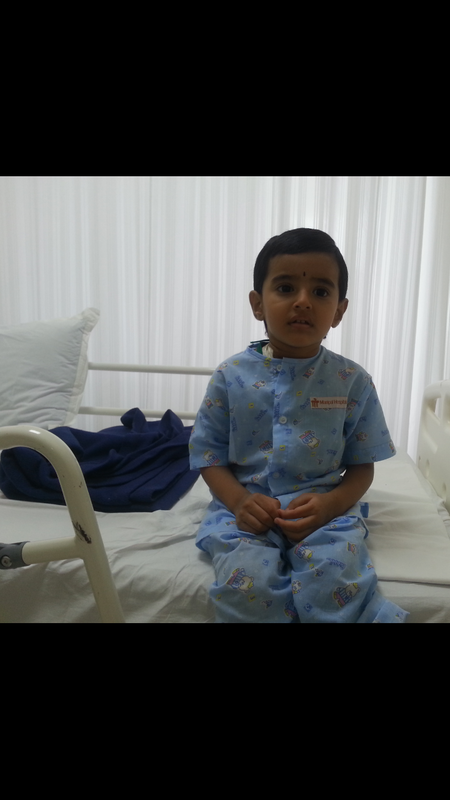 Ananya suffered from fever,pain,and anemia and was admitted to Manipal hospital. She was investigated and found to have severe anemia with low platelet count & presence of blast cell on peripheral smear. She was in the ICU for 7 days & taken for bone marrow test and to our horror we found that our daughter had leukemia. She has undergone one round of chemotherapy and need to complete 4 more sessions. 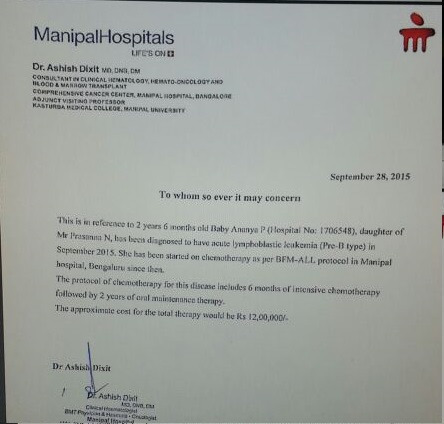 She is been treated by Dr ASHISH DIXIT.I have attached the letter from Manipal hospital below. I belong to an extremely humble background, with no family support. I was working as a sales executive and had to resign due to my daughter' illness. My wife is a homemaker. We cannot afford the cost of the medical expenses. We now look forward for your support in saving our beloved daughter. We have spent all our earnings and sold our jewellery to fund her medical expenses so far which has cost 7.5 lakhs for her ICU & first session and still need around 8 lakhs. We are facing financial hardships in providing for the rest of the expenses. We urge you to contribute anything within your means to help and save Ananya. Ananya has been undergoing maintenance therapy for two years now. Doctors had prescribed immuno-suppressants for her and she has been taking them for quite a while. As of now, doctors have scheduled few check-ups for her so that they could tell whether her therapy can be stopped or not. Also recently there has been incidents of blood in her stool, for which doctors have suggested few tests as well. Overall there has been improvement but doctors will decide the future course of action once the tests and check-ups are done. Thank you all for your support and love. We shall keep you all posted. I am Sudhakar, a Milaap Open fellow in Bengaluru. I spoke to Ananya’s father, Prasanna, on 27th September 2016. 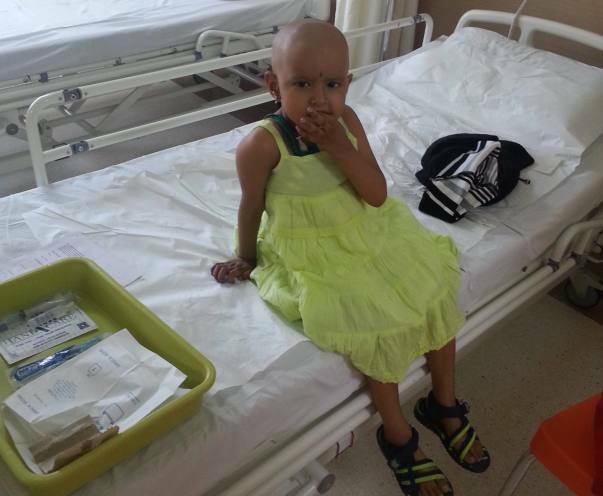 After the last update in April, Ananya’s haemoglobin and red blood cells count witnessed an increase for 2 months. She got 2 blood transfusions, which has helped her in recovering. Latest bone marrow biopsy results have shown that the recovery has been overall positive. But, there have been fluctuations in the blood cells count in a few tests because of which Prasanna has been worried. 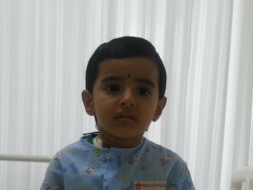 Ananya developed a fever on 24th September and she is currently undergoing treatment for it. She is currently on maintenance chemotherapy, which entails oral medications alternate days. Let’s pray for Ananya’s health and hope that she recovers as soon as possible. I would like to express my deep gratitude for all your generous support. We are happy to see her smiling and it was only because of all your prayers and generous supporting.